Seriously, who doesn’t love a good muffin? The soft interior, a delicious crusty top, the endless varieties/flavors/mix-ins/etc. 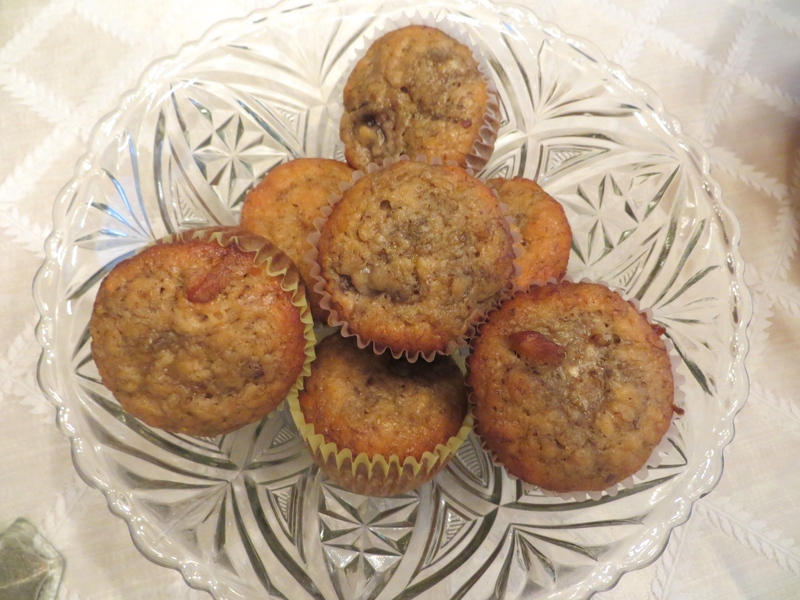 They are truly the star on any breakfast, brunch, or snack/teatime table… hence my enduring love for the muffin. But what I don’t love about muffins is that sometimes they end up being more cupcake than muffin. Don’t get me wrong, I would never turn down a super-sized double chocolate chunk muffin (which can be a whopping 366 calories), but for every day consumption, I like my muffins with a little more substance (and a lot less calories!). 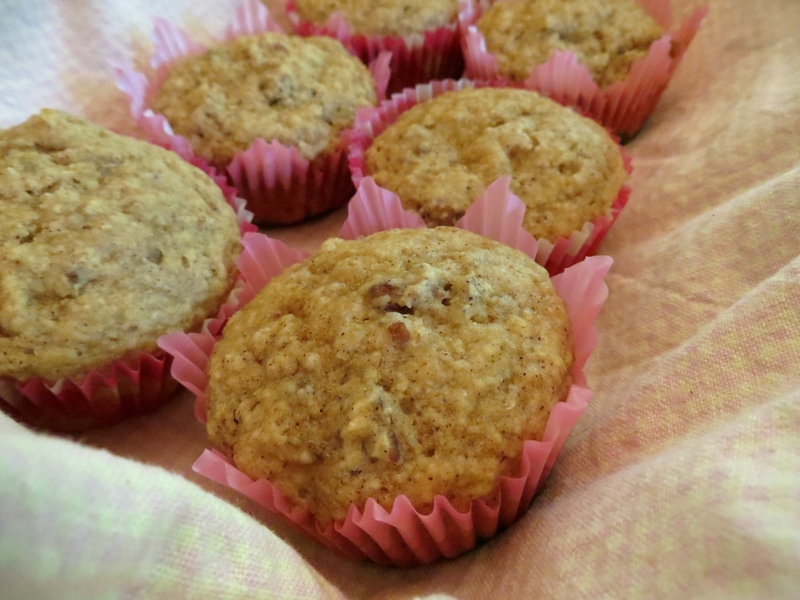 So when I had seriously overripe bananas sitting on my kitchen counter, I wanted to whip up some banana nut muffins with a healthier edge. So after doing a little research and some adapting, here is a recipe for banana muffins that is not only delicious, but nutritious too! Flour, oat bran (for a little nutty-ness), brown sugar, baking powder, salt, cinnamon, and nutmeg. 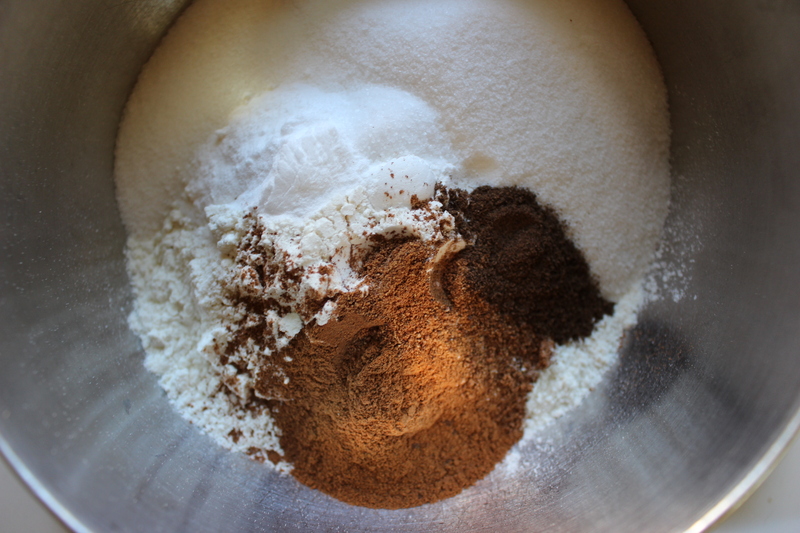 Whisk those ingredients together until smooth – be patient, the brown sugar likes to clump a little bit. Then pour in the wet ingredients – skim milk, some vegetable oil, an egg, some vanilla, and a healthy splash of whiskey… yes, I do like whiskey in my banana muffins. If you don’t like to use alcohol when you cook/bake, feel free to leave it out! 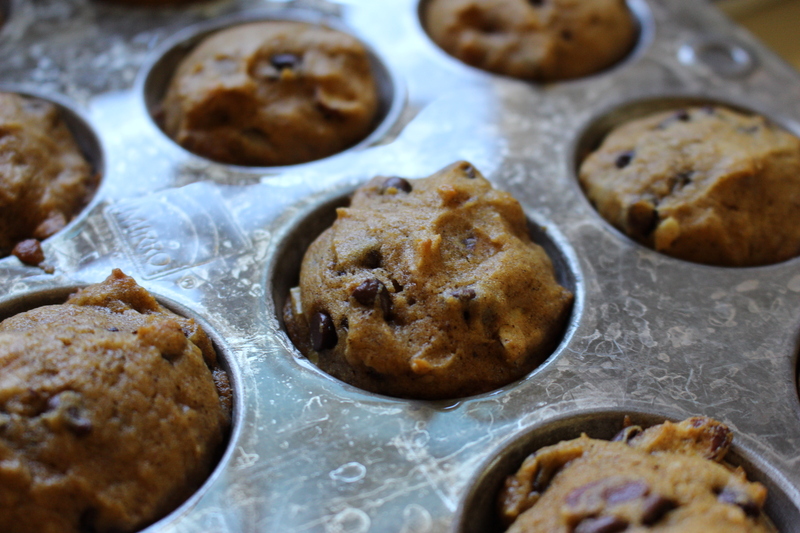 Gently stir the muffin batter until the dry ingredients just become moistened. Please don’t overmix your muffin batter… if you do, the muffins get tough and get those big air holes (which leaves you with more air and less muffin… not awesome!). All that’s left is to add in the stars of the show! I folded in two thoroughly mashed, almost too overripe bananas and a half cup of pecans that I finely chopped. Again, if you don’t like pecans, swap them out for a nut you like (such as walnuts), or if you are like E, leave the nuts out all together! Portion the batter into muffin tins lined with muffin cups… I have a passion for super cute muffin cups (pink gingham and pink flowers – yes please!). I used a ¼ cup ice cream scoop (#16 scoop) to make 14 muffins. You can also make about 40 mini-muffins if you use a tablespoon of batter per mini-muffin cup. The possibilities are endless!! Bake the muffins for about 18-20 minutes until they are slightly golden and a toothpick inserted in the center comes out clean. Serve alongside your breakfast/brunch favorites or with a cup of tea or coffee as an afternoon treat! Preheat your oven to 375 degrees. Line muffin tins with paper liners. In a large bowl, combine flour, oat bran, brown sugar, baking powder, salt, cinnamon, and nutmeg. Whisk to combine. In a small bowl, combine milk, vegetable oil, egg, vanilla, and whiskey. Whisk to combine. 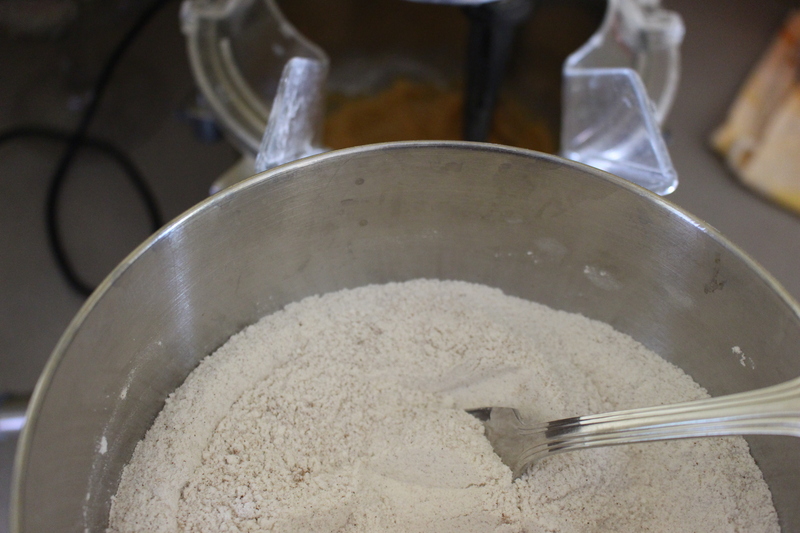 Pour the wet ingredients into the dry ingredients, mixing gently until the dry ingredients are just moistened. Add in the mashed banana and chopped pecans. Fold gently until combined. Portion out ¼ cup measures of batter into each standard muffin cup. If making mini-muffins, use 1 tablespoon of batter per mini-muffin cup. Bake the muffins for 18-20 minutes until the tops are slightly golden and a toothpick inserted into the center of a muffin comes out clean. Serve immediately or store in an air-tight container for 3 days (they also freeze like a dream!). These are my grandmothers. Both are forces of nature, committed to their families and communities, and they are both pretty skilled in the kitchen. 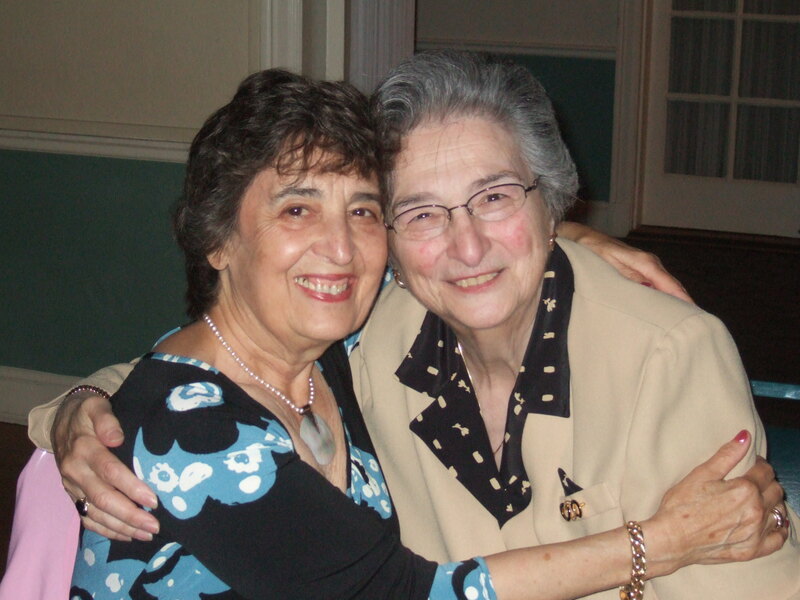 The YIA-E (on the left) can whip up dinner for an army, while The YIA-C (on the right) was an amazing baker. I like to think that I get my cooking prowess from one and my baking skills from the other. The one thing that I remember the most about The YIA-C is that every time we would go to visit and have a sleepover, we would always have zucchini bread in the morning. And this stuff was magical. The perfect balance of zucchini, sweetness, and warm bread goodness. Perfection in a loaf shape. Now that she can’t make it anymore, the zucchini bread mantle has fallen, waiting to be picked back up. So when I saw a 2-lb zucchini at the farmer’s market, I saw it as a sign. …you guessed it – zucchini. You need a heaping 2 cups full, so a couple medium-sized ones will do. Or part of a huge zucchini. Your choice. 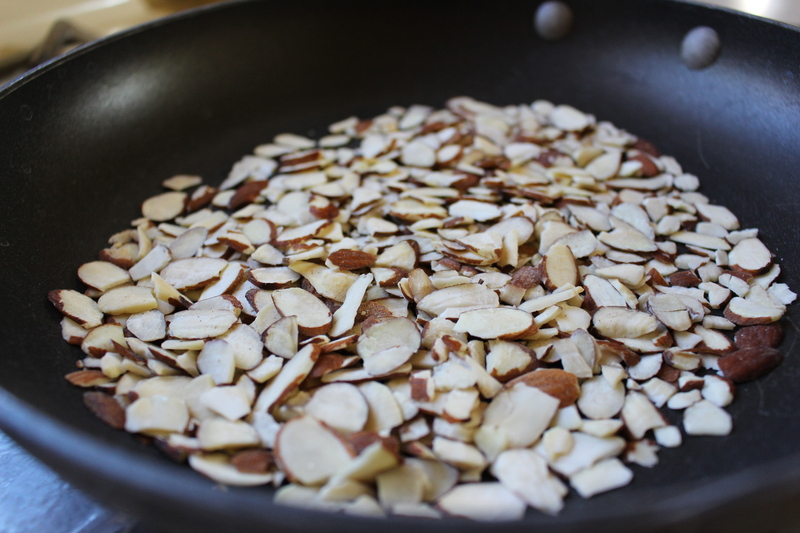 The dry ingredients are super simple – flour, baking soda, baking powder, salt, cinnamon, and nutmeg. I actually sifted them together… I am super lazy when it comes to sifting but please don’t skip this. It gives the bread a great texture. For the wet ingredients, grab your stand mixer, your hand mixer, or get your exercise and use a whisk. Beat together some sugar, vegetable oil, eggs, and some vanilla. The slowly add the dry ingredients… and don’t take a picture because you were spacing out thinking about how good this zucchini bread is going to taste. When the batter is just combined, add in the zucchini. And some walnuts. The YIA-C put walnuts in her’s and they do add a nice crunch. But if walnuts are not your thing, please feel free to leave them out. Pour into two loaf pans and bake for about 45-60 minutes at 325. Then you have two loaves of delicious perfection. A great accompaniment for coffee, tea, milk, juice, or ice cream! And a tribute to the woman who gave me my baking skills. 1. Preheat the oven to 325 degrees. Grease two 8”x4” loaf pans with non-stick spray and place parchment paper on the bottoms. Set aside. 2. 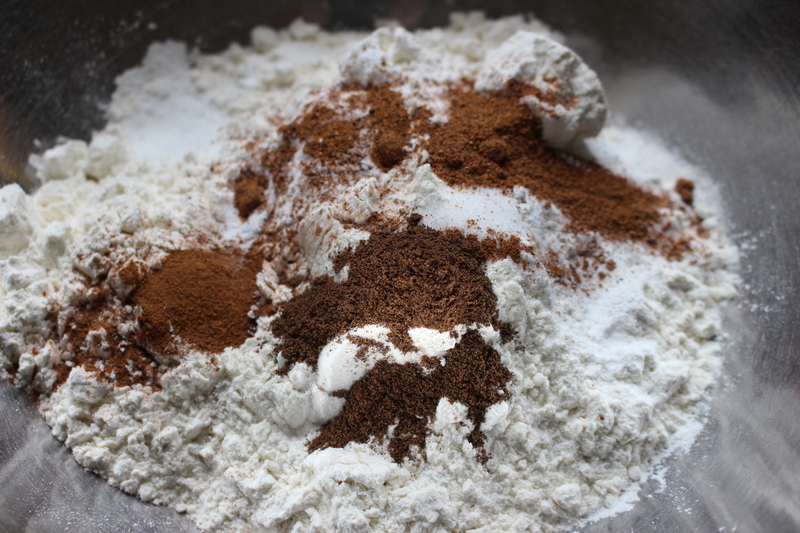 In a large bowl, sift together flour, baking soda, baking powder, salt, cinnamon, and nutmeg. Set aside. 3. 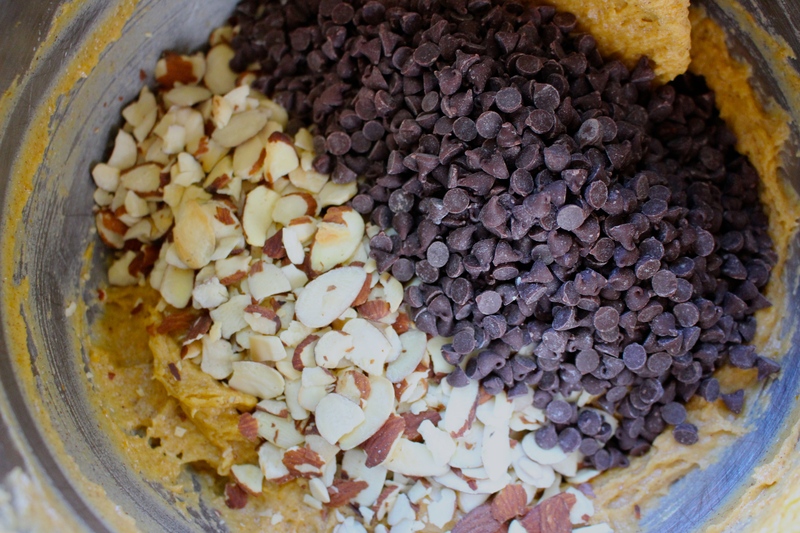 To combine the wet ingredients, use either a stand mixer, a hand mixer, or a bowl and whisk – your choice. In a bowl, combine sugar, oil, eggs, and vanilla and beat until combined. 4. Slowly add the flour mixture to the wet ingredients, mixing until just combined. 5. Gently fold the zucchini and walnuts into the batter. Divide the batter between the two prepared loaf pans and bake for 45 minutes to an hour until a skewer inserted in the middle comes out clean. Let cool slightly, remove from the pans, and then let cool completely. This recipe was adapted from All Recipes: http://allrecipes.com/recipe/moms-zucchini-bread/.